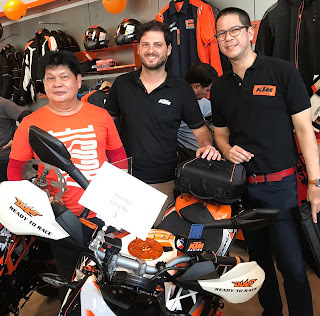 Albert Narciso, Jovs Mejias, and Alex Nocom were declared winners in the recently concluded KTM BGC Custom Bike Competition 2018, which was held in time for KTM BGC’s second anniversary. Besting other contestants, Narciso won in the All Original Category, Mejias in the Freestyle Category and in the Motul Voter’s Choice, and Nocom also in the Motul Voter’s Choice. The All Original Category showcases KTM motorcycles customized with original KTM accessories while the Freestyle Category allows for modifications and upgrades and is not limited to original KTM parts and accessories. The KTM BGC Custom Bike Competition 2018 was open to all KTM owners. Photo shows (L-R) Jovs Mejias, KAMMI managing director and COO Luca Martin and KTM BGC general manager Manu Sandejas.